Wanna contribute to this piece? 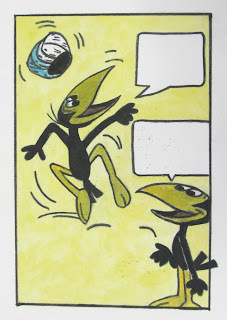 Below are several images showing the process for the current piece that I am doing, this time doing a trompe l'oeil of a comic book panel featuring Heckle and Jeckle. In the final image, you can see the current state of the work, which now has two blank text balloons where the dialogue between the two characters will take place. One is jumping up in joy, his turban flying off his head (changed from a top hat in the original comic book). He is saying something to the other guy, who in turns responds. I'd like suggestions for what Heckle and Jeckle are talking about, discussing or whatever. It can be something funny, something contemporary, whatever... just appropriate to the visual scene. Leave you suggestions in the comments section or email them to me. Winning suggestion will get a free, one of a kind signed print of the above work. The Smithsonian is looking to fill the position of Staff Assistant for the Smithsonian Latino Center. This is a rare opportunity to join the team that works hard at ensuring that Latino culture, achievement and contributions are celebrated and recognized nationwide. They are looking for an individual to assist the Director and can serve as the point of contact to the public, the Smithsonian National Latino Board, and Hispanic-serving organizations; provide administrative support to the staff, and help advance the Center’s initiatives and educational/public programs. **NOTE: Applicants must have the ability to speak and write in English and Spanish in order to assist with translation of materials.